Leading private sector hospital chain Narayana Hrudayalaya has chalked out a Rs 500 crore expansion plan, which will see it entering high-value markets in the country over next three years as well as making a foray into Africa. "After acquiring Health City, Cayman Islands, which is our sole overseas venture so far, we now plan to consolidate our domestic presence by entering the high-value markets like Delhi-NCR and Mumbai. We're also exploring opportunities in Africa," Narayana Hrudayalaya's vice-chairman and managing director Ashutosh Raghuvanshi told PTI here over the weekend. He said domestic expansion will be through a cluster- based approach and the initial focus will be Delhi-NCR. For overseas expansion, Raghuvanshi said, they have signed agreements with local partners in the Kenyan capital of Nairobi, for which they have also signed an agreement with an international financial institution for funding. This will be a greenfield project. 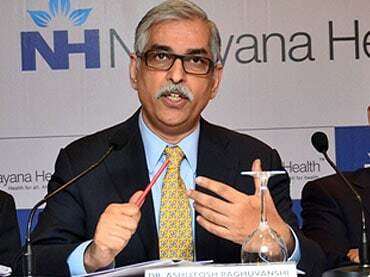 The domestic expansion will be in Delhi-NCR and Narayana will be commissioning a 200-bed hospital in Gurugram in January, he said, adding the capacity will be ramped up to 350 beds over next one-and-a-half years. Narayana recently opened its first hospital in Mumbai - the SRCC Children's Hospital, which is the only paediatric hospital in its portfolio. The super-speciality tertiary care for children has already completed 300 surgeries and screened 5,000 children in the outpatient department. On investments, Raghuvanshi said, "We're looking at an investment of Rs 500 crore over the next three years. Our focus is on continuously investing and upgrading existing and new hospitals in the country with a capex plan of Rs 100-150 crore per year." He said most of the annual capex will be used to improve technology, equipment and supply chains. Narayana has invested Rs 55 crore in Mumbai hospital in the first phase and an additional Rs 25 crore will be invested to increase capacity to 380 beds in the second phase, said Raghuvanshi. The company had picked up 71 per cent stake in Health City Cayman Islands for USD 32 million in 2015. It had a revenue of USD 12 million in the past quarter, he said. "We want the existing hospitals to mature but will keenly explore brownfield projects which have interesting growth possibilities," he said. Narayana has six focus areas across all its hospitals, Raghuvanshi said, adding that as a result revenue from the cardiac care side has come down from 90 to 40 per cent now. While gastro care chips in with 14 per cent, 11 per cent come from oncology and 10 per cent from renal sciences, he added. Raghuvanshi said the company will continue to focus on updating technologies in the healthcare delivery side like diagnostic equipment and advanced imaging. On the cluster approach, he said, "This approach is inspired by the advantages of sharing technical resources, human resources and supply chains so that a more profitable growth is achieved at the same time maintain quality, efficiency, transparent pricing." Narayana has a dominant presence in Bengaluru, Mysore and Shimoga in Karnataka and also in Kolkata, Jamshedpur, Guwahati and Jaipur. It is planning an expansion and upgrade of the Dharamshila Cancer Hospital in east Delhi to a super speciality hospital with 380 beds from the present 250, over the next few years, Raguvanshi said. The company also has a hospital each in Bellary in Karnataka and Palanpur in Gujarat on franchisee model, he said.